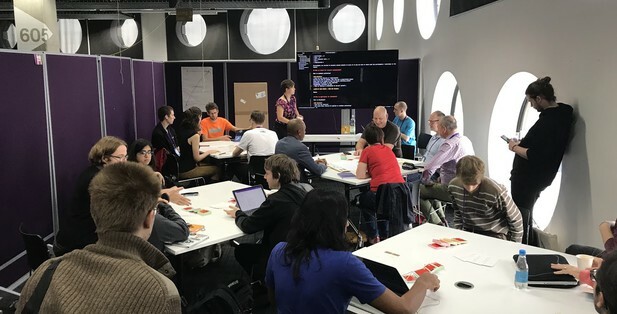 As Festival Lunch Partner, we facilitated activities and workshops on open science at MozFest 2017.
eLife was a Festival Lunch Partner at MozFest 2017, where we hosted our first eLife Open Science Soapbox on October 29. The event was a great opportunity to engage with the open-source, open-science community and, alongside our discussion workshop on Blockchain for Research and Open Science Public Park installations, gave us a chance to explore ideas and topics of relevance to the open-science mission. 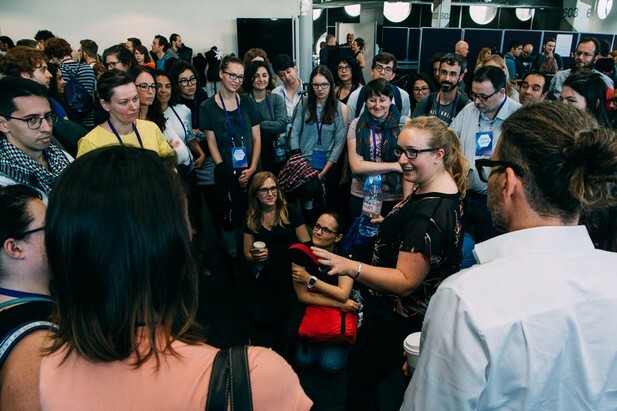 Taking place over the last weekend of October, MozFest is an annual festival of ideas, workshops and action towards a healthy internet that is open for all. Open science is an important topic at the event, attracting a strong cohort of project leads and contributors, from previous and current Mozilla Science fellows to newly interested members of the community. MozFest Open Innovation space facilitators and wranglers. Reused under CC-BY-NC 2.0 Mozilla Festival (source: Flickr). Over Sunday lunch, we heard from 13 attendees about their current open-science projects or new ideas. The participants more than met the challenge of pitching their project in less than two minutes and fielded questions from the captive and supportive audience. 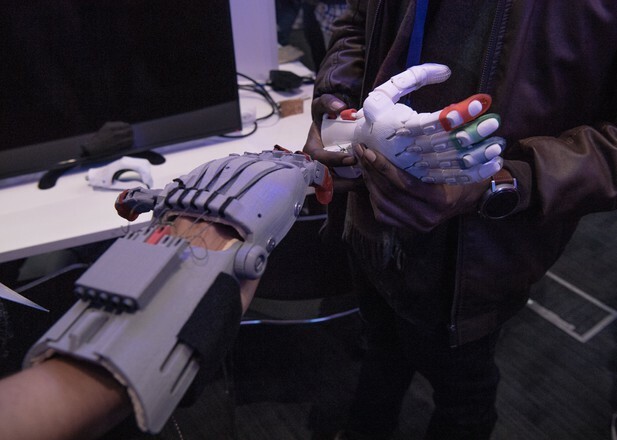 The evolution of a prosthetic hand by the e-NABLE global community. Reused under CC-BY-NC 2.0 Mozilla Festival (source: Flickr). Maria Esquela invited new people to join a global network of volunteers designing and producing 3D-printed prostheses to order, whilst Monica Granados requested help designing the user interface for a mobile app to share information about contaminant levels in local fish stocks in Ontario. Nokome Bentley invited the community to create open function libraries for research analysis to enable easy lookup for use in Stencila Sheets. Raniere Silva pitched a new idea: to avoid the lengthy process of submitting a pull request for the smallest improvements on code and documentation files, could hypothes.is be used to suggest a change on the GitHub Pages and automatically open an issue for the code author to resolve? And Caroline Kuhn proposed a new virtual interface that would allow students to become more active consumers of tools on the web rather than being constrained by institution-wide choices. Presenters at the eLife Open Science Soapbox. All the presentations are on YouTube and you can find out more about the projects and how you can contribute here. Attendees also shared their projects and offered contributions to other projects all weekend through the Open Science Public Park in the Open Innovation space. 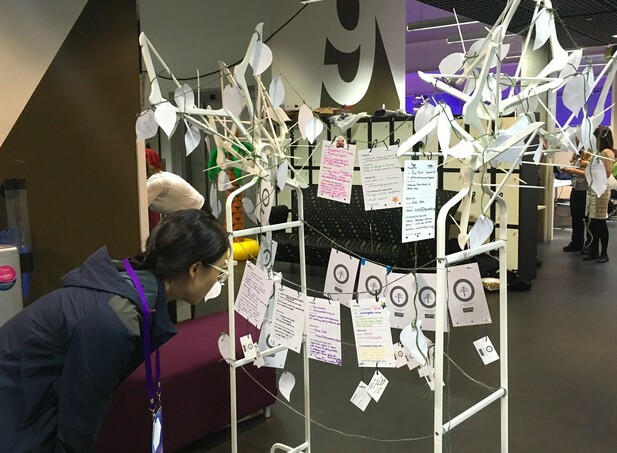 By the end of the weekend, the wish tree installation was hanging heavy with nearly 20 project wishes, ranging from tools and initiatives for collaborative and reproducible science through to open-source, 3D-printing and hardware projects and programs to encourage the next generation of coders. Reading the projects on the wish tree in the Open Science Public Park. Fellow MozFest attendees offered to contribute to these projects: from setting up a preprint journal club in Brazil to test PREreview, and adding astrophysics and ecological data to Dat, to proofreading a survey seeking to understand how under-represented minorities are treated in research. Others pledged to test collaborative tools listed at Science Together online, to contribute R lessons to the Open Teach-R project, and to contribute code to ContentMine. You can browse the wishes and pledge contributions here. Yo Yehudi’s discussion exploring how to promote more open code in research. The group outlined the current situation, suggested barriers to sharing, and identified actions that will feed into Yo’s project, ‘Code is Science’ (session notes | project website | project GitHub). Daniela Saderi and Samantha Hindle’s discussion about the use of preprints in scientific publishing. They introduced their resources for reviewing preprints in journal clubs (session notes). Their project, PREreview, is featured on eLife Labs. Rachael Ainsworth’s workshop to identify how to break down key barriers for researchers interested in practising more open science (session notes). A key output was the idea to design a “Hello, world” beginner’s exercise for open science, which will be added to her project, ‘Key Resources for Open Science in Astronomy’. Chris Hartgerink’s ideation session to gather new ideas for a utopian research ecosystem. The post-it ideas are viewable here [PDF]. Blockchain for research: opportunity or hype? Our Innovation Officer, Naomi Penfold, joined Kade Morton, co-founder of Aletheia, an open-source project to build a decentralised open-access publishing platform, to co-facilitate an interactive workshop exploring how blockchain technologies could be applied to academic publishing. Discussing the applicability of blockchain technologies for academic publishing. During the workshop, the participants highlighted important requirements of a research communication system, including a distribution mechanism for content — all and any research output, not just publications — that ensures it is findable and accessible, plus incentives that credit researchers for all their work as authors and reviewers. Several of these requirements matched key features of blockchain technology systems, namely as an alternative means of incentivising contributions and a verifiable record of communications such as peer review. It was noted that a hyperledger is for recording metadata and not for distributing the research output itself. So, blockchain would not be used directly to share academic content, but to log and store (immutably) the who, what, when, where and how of the sharing of this content. Several workshop participants also pointed out that alternative technologies could have the potential to fulfil the requirements of a future research communication system, such as peer-to-peer decentralised distribution systems, without the need for the complexity and expense of blockchain technology. Full notes from the discussion can be found on GitHub. MozFest brings people together to stimulate innovation and collaboration to build a healthier web. But it doesn’t end when the doors close at the end of the event. The projects started and developed over the weekend will continue, and you can help. The projects showcased at the eLife Open Science Soapbox and the Open Science Public Park are open for contributions. Our thanks go to the MozFest organisers, space wranglers, facilitators and attendees. 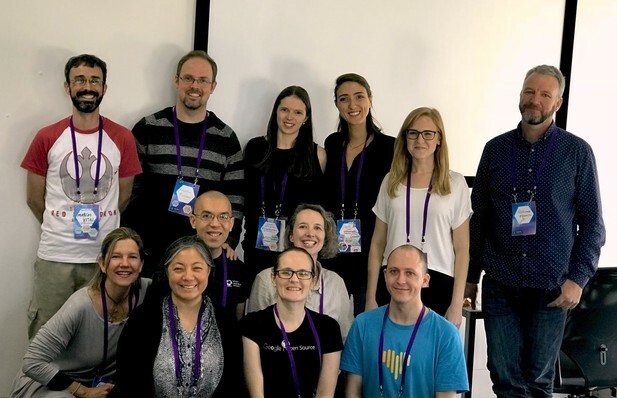 Special thanks to the volunteers who facilitated the eLife Open Science Soapbox event, in particular Charlie Stone for note-taking and audiovisual support and Rudi Bonfiglioni for collating information for Mozilla Network Pulse. This blog is cross-posted on Medium. Do you have an idea or innovation to share on eLife Labs? Please send a short outline to innovation [at] elifesciences.org.